After the recent remodel of our kitchen, I decided that I wanted to designate an entire drawer to the bento stash. Because the bento stash had grown a little out of control. But I wanted to use this stuff more. I needed to keep it all in one place to keep all of the tiny pieces together. Easy access. I wasn't about to store all of this stuff in random plastic containers high up in my cupboards, where they had been stashed before. I'm sure there's nothing more entertaining than watching me teeter on a chair, reaching to the top shelf just to have an avalanche of six plastic Glad-lock containers bounce off my head. But yeah. Everything is in a messy, unorganized state at the moment but this has been so nice. Even when it's messy, it's so much more convenient. It's become the kid catch-all drawer. 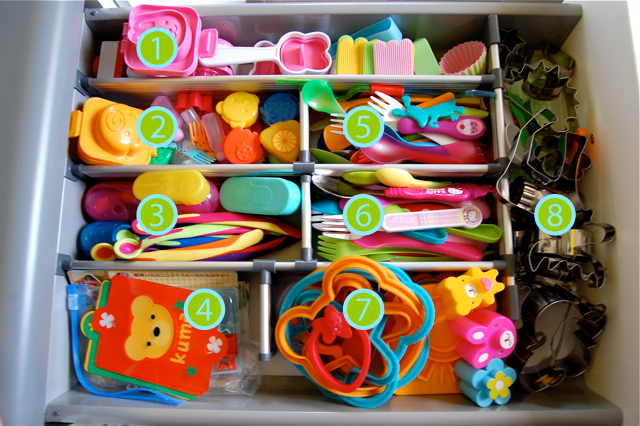 To break it down, in case you're interested, here are my most-used must-have bento supplies. 2. Another hard-boiled egg shaper (bear) and tiny sauce containers, which are great for ketchup or soy sauce or what-have-you. Food picks. I love food picks and use them a ton. 3. Baby spoons for Bowie. Two enclosed lunchbox utensil sets that hold a fork and spoon. And the rounded oval things are hotdog shapers. They are crazy. You can find them here. 4. More baran sheets and a small nautical deco cutter set. 5. Spoons. A plastic dog. A weird straw. But it's supposed to be just spoons. I love seeing other people's bento collections and how they organize everything. How do you do it? 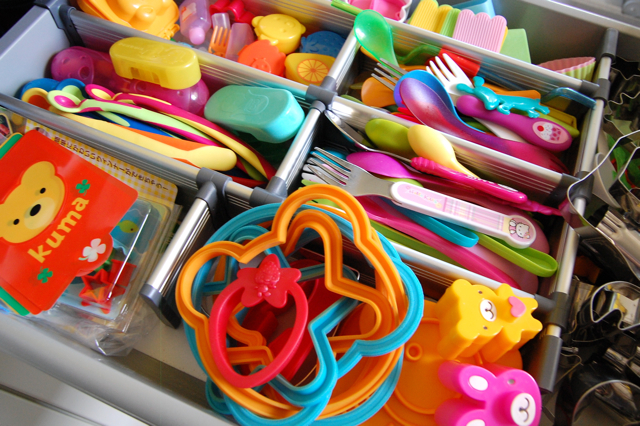 I was just thinking "how am I going to start organizing all this bento stuff?!" Guess I need to clean out the junk drawer so we can do this too. Oh and the hot dog shaper thingy, gatta' have it! That's a huge collection! I can't find bento supplies in my area. I wish i can have all your stuff. More bento post! I want to see how you do your cute lunches!